Naruto chapter 664 is the next most awaited Naruto shipudden manga chapter to be released this week. Last chapter was epic! There were lots of key events that happened in the last chapter. 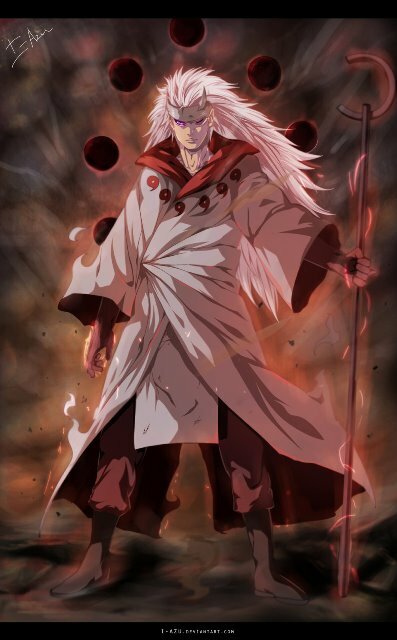 Madara finally became the Juubi’s Jinchuriki and was able to obtain the power of the Six Sage of Paths. I don’t know how do you call Madara now; “Rikudou Madara” or “Madara Six Sage of Paths” or even “Madara Juubi Mode“, but one thing is for certain Kakashi is going to face an enemy that is totally out of his league. Meanwhile Gaara, Sakura and the almost dying Naruto is on their way to the 4th’s place, where they will find the other half of Kurama. Can they make it in time? Most probably they will. And who is this mysterious person standing near Sasuke? Is he/she a friend or foe? Will he help Sasuke? Let’s find out in Naruto 664. UPDATE / WARNING SPOILER: Naruto 664 was recently released. The chapter didn’t reveal who the person was standing near Sasuke. But they sensed a bad feeling about this mysterious person. Probably it’s really Kabuto. Second, Gaara, Sakura and Naruto arrived to where Minato and Kakashi are. Minato tries to transfer the other half of the Kyuubi but theBlack Zetsu interfered. It seems that the Black Zetsu “stole” the other half of the Kyuubi! Finally Rikudou Madara shows up in the scene. Now they are really in trouble. In Naruto chapter 664, it is expected that we will see Kakashi face Madara since it was mentioned in the previous chapter. A lot of Naruto fans are already pissed off by Madara. He’s too powerful now. It’s like an overkill for them and how the heck are they going to stop Madara now? But Madara is still not perfect yet without his left Rinnegan eye. That’s why he is heading towards Kakashi’s group to get his left eye out of Obito’s head. Anyway, we are not sure yet whether Kakashi will really fight Madara. I mean Madara vs Kakashi is not a really great idea at all. Kakashi won’t stand a chance against Madara. But I think a fight between them will happen, eventually. I read from a forum where a certain forum member (sorry forgot the forum or page) mentioned that Kishimoto is planning to reveal Kakashi’s full face. This might happen during the fight of Kakashi vs Madara. Well, let’s just see that in the next chapter. Who is the Person Next to Sasuke? A lot of us are having a debate on who is the person who appeared right next to Sasuke. Is he a friend or an enemy? Will he help Sasuke or end his life for good? Sasuke is one of the main character in Naruto and I’m pretty sure that he will not die here. So most probably this person will help and save Sasuke. But who is this person? A lot of Naruto fans are convinced that the person standing next to Sasuke is non-other than Kabuto. Primarily because the person didn’t wear any sandals or shoes and Kabuto fits the description. If you don’t agree with that then hit the comment section below. Did Kabuto break Itachi’s Izanami and come to help Sasuke? Let’s find out that also in the following chapters to come. Will Sasuke Achieve Rinnegan Eyes? The formula to awaken a Rinnegan Eye is that you should have activated your Eternal Mangekyou Saringan + you should also have Hashirama Senju’s DNA and you must be in a near death situation. There are lot of Naruto fans who would like to see Sasuke having a Rinnegan eye. But one thing is missing from the equation, Sasuke doesn’t have a Hashirama DNA. If he will have, probably in the future, who will give Sasuke some Senju DNA? Is the Spiral Zetsu Yamato? Another thing that we should look out is, who is this person inside the spiral zetsu? In the last chapter, his left ear was revealed and highlighted after Suigetsu was able to land a direct hit on his mask. A lot of Naruto fans is convinced that the person inside the spiral zetsu is non-other than Yamato, claiming that the ears are very similar. Personally I didn’t see any similarities at all. And how in the world did Yamato end up inside a Zetsu’s body? Well, if his ear was highlighted I’m sure that the person inside the Spiral Zetsu is an important character, otherwise Kishimoto wouldn’t highlight that scene. There you have it guys! There are lots of things that we should watch out for to answer our questions starting the next chapter. This is going to be epic as fighting grows hotter and the twist in the story becomes more and more interesting. Naruto chapter 664 spoiler isn’t available right now. Usually it’s one day before the chapter is released. And most of the time spoilers aren’t released or leaked anymore. So better just wait for the chapter to be released. Naruto 664 release date is expected to be this coming Wednesday (Tuesday in some parts of the world).